A Palestinian-American teen who was beaten, badly injured, and detained by undercover Israeli police officers in Jerusalem on Thursday is set to be tried Sunday, a rights group said. Tarek Abu Khdeir, 15, was beaten in the Shufat neighborhood at around 8 p.m. by Israeli police in the yard of his uncle’s home and arrested without charges, Addameer said on its website Friday. His family was not permitted to see Tarek until he was hospitalized, the rights group said. His detention has been extended until Sunday morning, when a hearing will be held at the Court of First Instances in Jerusalem. The Council on American-Islamic Relations called on the US State Department to secure Tarek’s release, the report said. 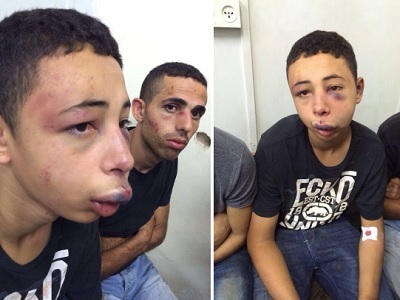 Tarek is one of 11 Palestinians who were beaten and arrested in the neighborhood on Thursday, Addameer said. Video footage of Tarek’s beating emerged Thursday. The video, posted on Youtube by Palestine Today TV shows what appears to be masked Israeli police in riot gear beating, kicking, and stamping on a Palestinian. Abu Khdeir’s death sparked mass protests in East Jerusalem, especially the Shufat neighborhood, and other West Bank areas, leading to clashes with Israeli forces in which hundreds have been injured. “State-sanctioned violence against children is unlawful and unacceptable,” Addameer said in its Friday report.